UNITED NATIONS, January 12 -- How does a UN agency claim to promote human rights to corporations while staying silent on human rights to governments which torture? The UN Development Program has announced a million dollar program to promote corporate social responsibility in five European Union member states (Bulgaria, Hungary, Lithuania, Poland and Slovakia) and three candidate countries: Croatia, Macedonia and Turkey. Already, UNDP has taken on the role of promoter, to different degrees in differently countries, of the UN Global Compact. In the course of Inner City Press' reporting to date on the Global Compact, even some within the Compact have acknowledged the desirability of increased transparency, including an opportunity for questioning of corporate chieftains who come for photo opportunities with senior UN officials. An executive who slipped in and out of the UN without taking questions -- but getting a photo with Kofi Annan -- was the head of Turkey's Koc Industries, a company listed on UNDP-Turkey's website. Koc is the largest private employer in Turkey, where UNDP's executive director comes from, and apparently will return to, given that his few press comments in 2006 were disproportionately about Turkish political issues. UNDP's Europe and CIS page trumpets "Microsoft in Lithuania, Cisco Systems in Bulgaria." 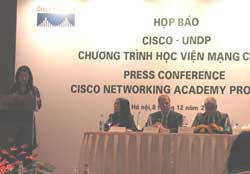 In Mr. Dervis' home country's site it is stated that "UNDP Turkey has been in an agreement with Cisco since 2002, to expand Cisco's Networking Academy Program in less developed regions of Turkey." UNDP also touts its partnership with Coca-Cola, including by UNDP's Kalman Mizsei placing UN and Coke flags together, and on fliers with joint Coke and UNDP logos, without any mention of widespread campus boycotts of the company for its labor policies in Colombia and environmental policies in India and elsewhere, issues noted in such mainstream and presumably UNDP-read newspapers as the UK's Guardian. Inner City Press previously reported on the lack of Compact compliance of F.C. Barcelona, which reporting Global Compacy staff have since credited for renewed engagement by this global sports team. Last week to its credit the Compact de-listed an additional 203 companies. What will UNDP's policy be on evaluating its corporate partners? What disclosures will be made? It's worth noting for example that the government of Norway has already been funding UNDP's "corporate social responsibility" and financial literacy work in Croatia. 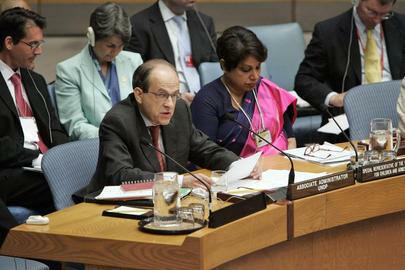 Click here for UNDP's web page on this, which lists the funder but not the amount of the funding. But the larger contradiction is the contrast with UNDP's silence about blatant human rights violations by governments in violation of international law. In Uzbekistan, for example, despite widespread reports of torture of political dissidents and violations of refugee protections, UNDP helps the Karimov regime to collect taxes, and to work on the Internet (which the regime blocks access to for most citizens). UNDP's country representative in Uzbekistan has stated to Inner City Press that the Millennium Development Goals have nothing to do with human rights. Click here for more, and click here for Inner City Press in other media about UNDP and Turkmenistan. What then is the credibility of this agency in urging corporations to follow human rights laws? As previously asked, will UNDP evaluate its senior officials in terms of human rights? Smaller-scale, will UNDP endeavor, as the Global Compact at Headquarters has committed, to making its corporate partners available for questions about this human rights and "corporate social responsibility" records? We'll see.